BlenLdeEr SNtatiDonsE&RUni-ServTSApeeTd BIaOr NS                    blendeR stations Includes Four Galvanized Legs w/ Adjustable Plastic Bullet Feet Featuring Adjustable Galvanized Side Cross-Bracing All Faucets Meet Federal Lead Free Standards All Blender Stations Include A 15A - 120V GFI Duplex Receptacle Hidden Beneath Blender Shelf WANT US TO CONNECT IT? Add SU-24 Price Per Every Two Units $140 • SL-RS Series Includes 4” O.C. Splash Mounted Swing Spout Faucet • CR-RS Series Includes 4” O.C. Deck Mounted Swing Spout Faucet And Has Rear Deck For Extra Storage   SL-RS Series 23” Wide Units With Splash Mount Faucet CR-RS Series 26” Wide Units With Deck Mount Faucet Weight Cu. Ft. • • • • • • w/ Dump Sink & Faucet Dump Sink 4” Backsplash 15A - 120V GFI Duplex Outlet Hidden Beneath Shelf Recessed Step For Blenders Grommet Hole For Blender Power Cords 1” IPS Drain  Overall Length 23” WIDE Price Approx. Approx. Weight Cu. Ft. 26” WIDE Price Approx. Approx. 12”  SL-RS-12  $952  20 lbs. 6  CR-RS-12  $1022  21 lbs. 6  18” SL-RS-18 1092 23 lbs. 6 CR-RS-18 1138 23 lbs. 6     Double Step Blender Station • Features Two Blender Stations For High Volume Mixing Areas • 15A - 120V GFI Duplex Outlet Hidden Beneath Shelf • Grommet Hole For Blender Power Cords • 4” Backsplash NOTE: Blender Stations Can Not Accommodate A Speed Rail • CR-DB Series Has Rear Deck For Extra Storage Overall Length 23” WIDE Price Weight Cu. Ft. Approx. Approx. Weight Cu. Ft.   Approx. Approx. 26” WIDE Price   12”  SL-DB-12  $635  20 lbs. 6  CR-DB-12  $686  21 lbs. 6  18” SL-DB-18 721 21 lbs. 6 CR-DB-18 744 22 lbs. 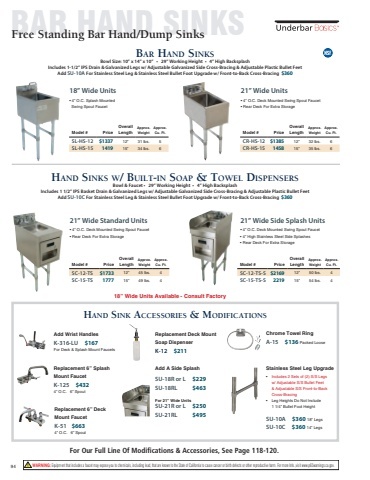 6  SL-DB Series 23” Wide Units CR-DB Series 26” Wide Units  blendeR station accessoRies & ModiFications A-15 Chrome Towel Ring (Packed Loose) A-16 Perforated Basket (Fits 10” x 14” x 10” Sink) A-17 Perforated Basket (Fits 9-1/2” x 11-1/2” x 6 Sink) K-316-LU Add Wrist Handles SU-10A 18” Stainless Steel Leg Upgrade (Set of 4 -Includes Adjustable Front-to-Back Cross-Bracing) .......... $96 .......... 239 .......... 234 .......... 109 .......... 243 Add A Liquid Waste Chute • 5-1/2” Diameter Liquid Waste Chute • Includes K-54 Push-Back Water Filler Faucet SU-36 $833   Blender Station w/ Dump Sink Drainboard Ice Bin Removable Bottle Rack Speed Rail • 4” Backsplash • 26” Front To Back • SRK-30 - 30” Speed Rail • 30” Insulated Ice Bin • 98 lbs. Ice Bin Capacity • Two Removable Plastic Bottle Racks • Optional 7-Circuit Cold Plate Sealed Into The Bottom Of Ice Bin • Dump Sink • 4” O.C. Deck Mounted Swing Spout Faucet • Recessed Drainboard for Glassware • Dual Blender/Mixer Recess • Galvanized Legs w/ Adjustable Plastic Bullet Feet & Adjustable Galvanized Side Cross-Bracing uni-seRV sPeed baR 12” Deep Ice Bin w/ Dump Sink, Recessed Drainboard & Blender Station • 29” Working Height      15A - 120V GFI Duplex Receptacle Hidden Beneath Blender Shelf   Model # Price Overall Length Approx. Weight Approx. Cu. Ft.   CRU-60L or R  $3391  60”  110 lbs. 23  w/ 7-CIRCUIT COLD PLATE CRU-60L-7 or R-7 4753 60” 193 lbs. 23  CRU-60R Shown L And R Indicate Ice Bin Location. 94 WARNING: Equipment that includes a faucet may expose you to chemicals, including lead, that are known to the State of California to cause cancer or birth defects or other reproductive harm. For more Info.,visit www.p65warnings.ca.gov.